Melt butter and cook egg 2 minutes each side or until desired doneness. Sprinkle with salt and pepper. 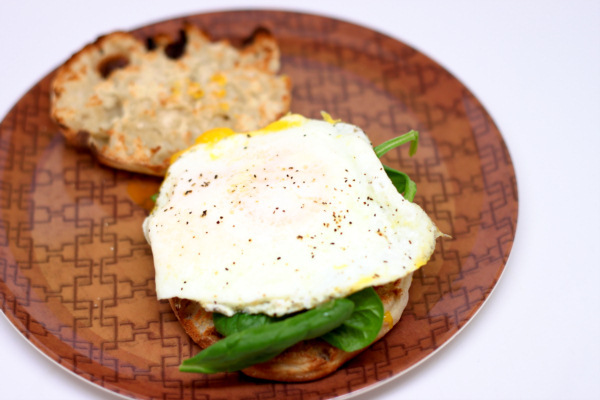 Spread cheese on toasted muffins, add egg and spinach and make a sandwich. Heavy, filling and a great sandwich for a cold and blustery day. I think it works just as well as a breakfast sandwich as it does a lunch sandwich ! Heat skillet and spray with Pam. Scramble egg beaters or make a little circle out of them so they stay on the bread nicely. When toast is done, spread one piece with beans. 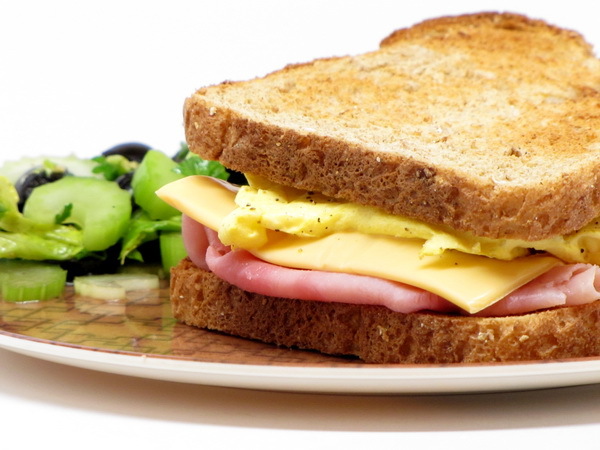 Then add ham, cheese, warm eggs and sprinkle with salt and pepper, and top with the final piece of bread. Sweet honey keeps all the ingredients stuck together. These are great to keep on hand for when you get a ‘sweets attack’. So healthy, so full of MUFAs, yet honey sweet and just a bit chocolaty. Preheat oven to 300 degrees and line an 8×8 square baking dish with parchment paper letting it overhang so you have ‘handles’ to pull up the bars when done. 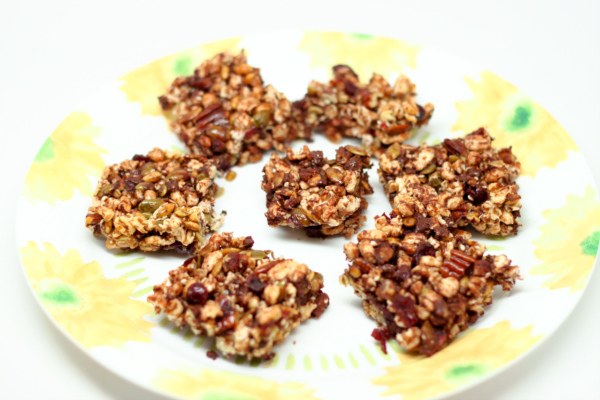 Mix cereal, nuts, seeds and cranberries. In a saucepan heat honey, vanilla and salt 2-3 minutes. The pour this over the dry ingredients and mix well then add chocolate and press it all into the prepared pan and spread it out. You can spray a wooden spoon with Pam to help. Bake 30-35 minutes or until top is brown. Use a knife to loosen the bars from the unlined sides of the pan and lift the whole thing out and set on a rack to cool a bit. Cut into 16 bars. Sometimes it’s the simplest things – and that is the case of this ‘recipe’. 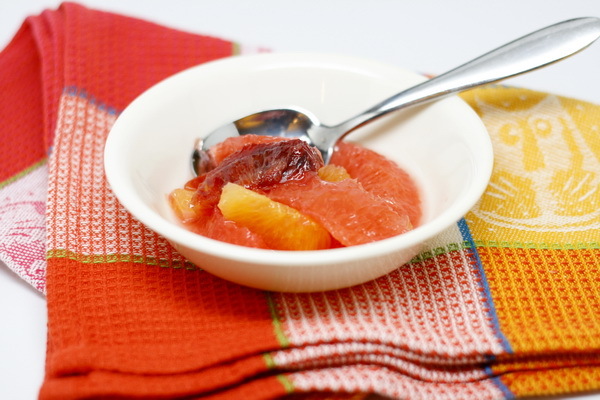 By adding a dusting of powdered sugar to already sweet fruit, you get a super taste sensation that the kids will gobble up. Try serving with some yogurt for a great breakfast. 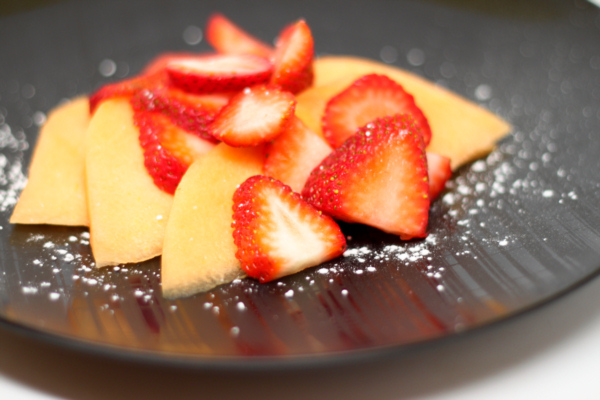 Place fruit on a plate and sprinkle with sugar. I love a dish you can make for a hungry breakfast crowd that doesn’t entail you standing at the stove being a short order cook 😉 You can put this one together and throw it in the oven then sit and have coffee and chat while it cooks up perfectly. It turns out a flavorful Mexican inspired dish that everyone enjoys ! Preheat oven to 350 degrees. Cook sausage, peppers and onions in a skillet until sausage is done, and then drain on paper towels. Place in a 13×9 baking dish sprayed with Pam. Mix eggs, green chilies and chili powder and pour over the turkey mix. Bake uncovered 30-35 minutes or until set then break up with a spoon. 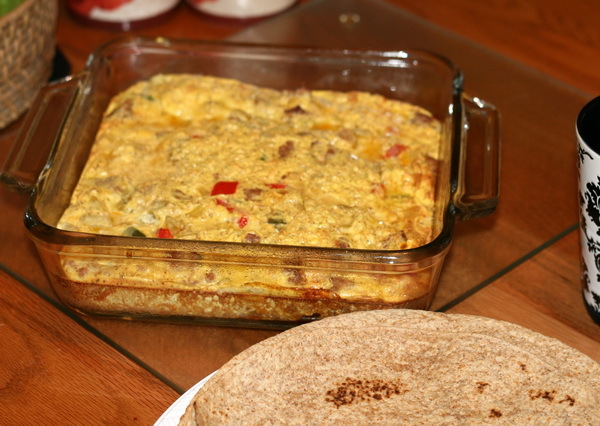 Place 2/3 c of egg mix down the center of each tortilla then wrap up securely. 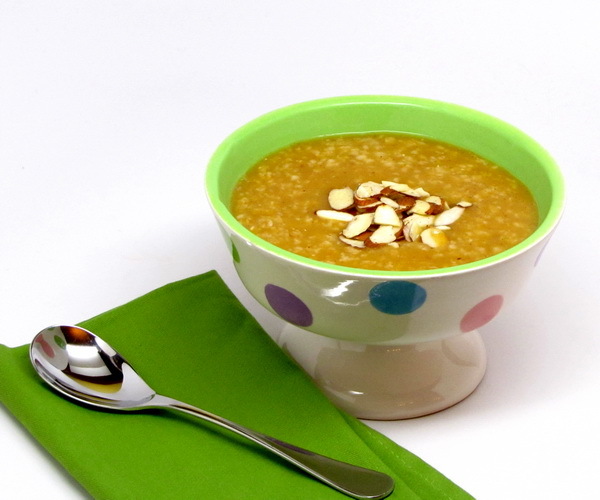 The ginger in this recipe is a nice unexpected flavor that makes it just perfect. This works just as well with regular bread and with a quick dip rather than chilling over night. Mix eggs, whites, milk, sugar, molasses, ginger, allspice and salt. 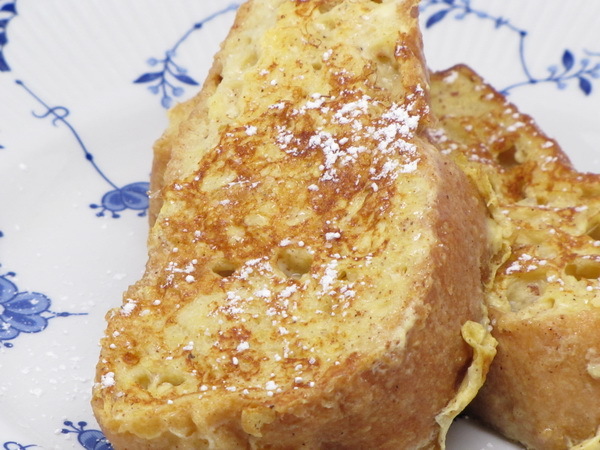 Place bread in a 13×9 baking sheet and out the egg mix over it and refrigerate overnight. Heat butter on a griddle and cool bread 3 minutes each side. Talk about decadent and delicious !! 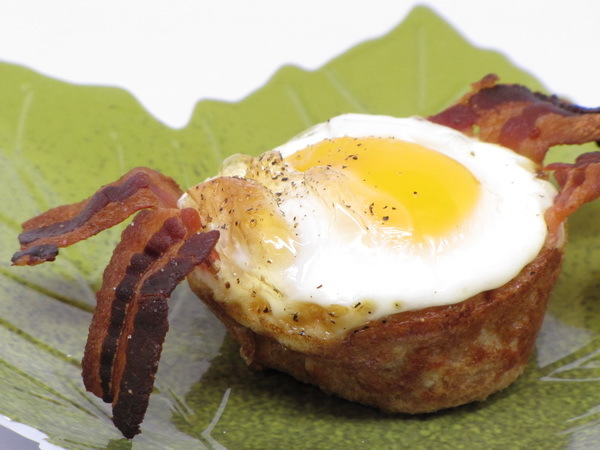 This breakfast dish will give you legendary ‘short order cook’ status ! 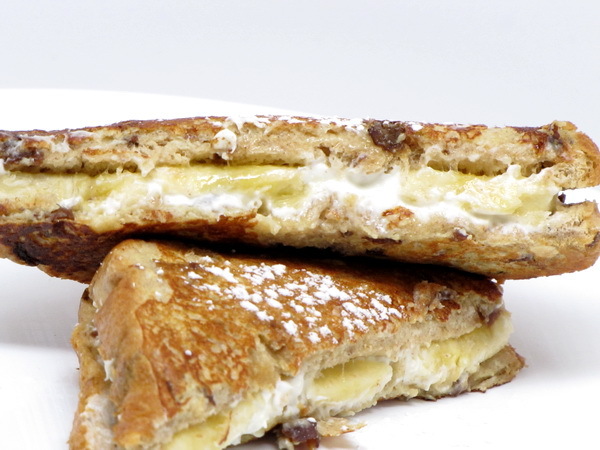 The bananas and cream cheese make a perfect middle to the grilled raisin bread. Spray skillet with Pam and heat well. Mix milk, cheese, eggs, sugar, flour and vanilla with a mixer until. Take 4 slices of bread and spread with cream cheese then add banana slices and top with the remaining bread. Gently dip into the egg mix and then place on pan and cook 2-3 minutes. Flip and cook another 2 minutes. Cut in half and sprinkle with powdered sugar before serving.